"Emergency management professionals provide the framework for our society's survival after disasters occur. Given how consistently disasters occur and the need to limit the damage from emergencies and disasters, there is now, more than ever, a need for emergency management professionals. In fact, the field is expected to steadily grow well into 2024. The below infographic, created by Arizona State University's Online Emergency Management and Homeland Security (EMHS) degree program, explores the field of emergency management and the various professions one might pursue." Print-out providing a layout for small group collaboration during Community Wildfire Protection Plan (CWPP) Community Meetings. HWMO has helped develop Community Wildfire Protection Plan (CWPP) for most of the priority fire-prone regions of Hawaii. The plans assesses values at risk such as safety, natural resource protection, recreation, scenic values, and economic assets. 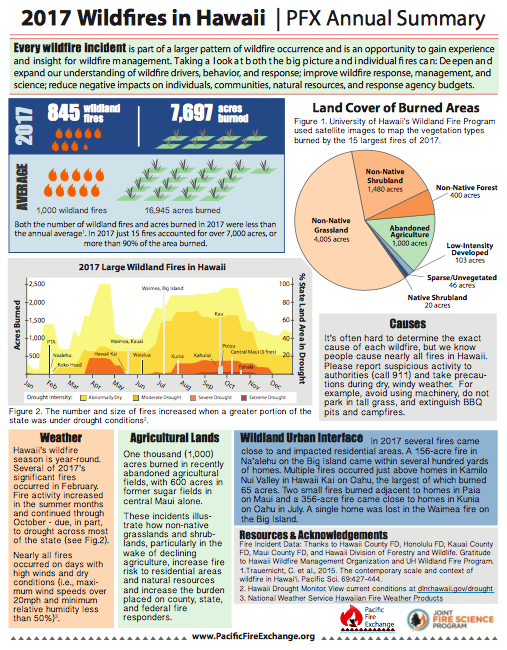 Through a collaborative process involving input from community members, resource management and firefighting agencies, and a variety of other interested parties, CWPPs help bring wildfire hazard information and planning and action opportunities to all parties.